Between 1995 and 2005 the trAce Online Writing Centre hosted and indeed fostered a complex media ecology: an ever-expanding web site, an active web forum, a local and and international network of people, a host of virtual collaborations and artist-in-residencies, a body of commissioned artworks, the trAce/Alt-X International Hypertext Competition, the Incubation conference series, and frAme, the trAce Journal of Culture and Technology. What emerged was one of the web’s earliest and most influential international creative communities. Its members were diverse, ranging from media-curious workshop participants to artist-in-residencies by some of the most well known practitioners in the fields of new media and digital writing today. What they had in common was that used the internet as a medium and a meeting place, platform to generate, disseminate and debate new media writing writing practices. To give a full account of the history and output of this one-of-a-kind moment-in-time community would take an eternity. Fortunately, there is no need. 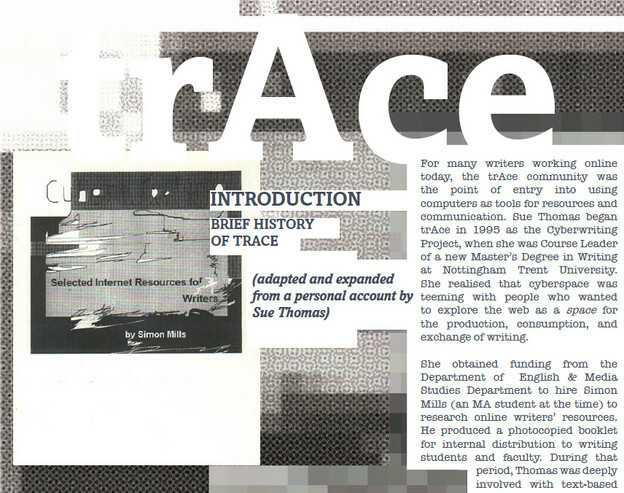 Fittingly, considering its humble beginnings with photocopy, among the last outputs of the trAce Online Writing Centre was also a booklet of sorts, this time a full-colour fully-down-loadable PDF one: trAces: A Commemoration of Ten Years of Artistic Innovation at trAce. vika says, "Ah, hello mez. I see you are "all"." mez says, "Yeah, sorry about that:) negate that qs if possible, yeah?" mez says, "So we r earli then?" mez says, "So vika, wots yr story? :)"
vika says, "Five more minutes, by my clock." vika says, "Well, it's all in my "bio". :)"
mez says, "Not b-ing a regular MOO boffin, can I ask how 2 check that please?" vika is very new to the MOO interface and is 'sploring. The trAce Online Writing Centre supported experimentation with new literary forms, new softwares and and new hardware platforms which are now antiquated. As a result, the contents of th the trAce Archive are wildly uneven. Some works don’t work anymore. Some were experiments which never worked in the first place. Some links are broken, which is sometimes more informative than if they were not, for breakage exposes, breakage reveals. Browsing through Assemblage: The Women’s New Media Gallery, Carolyn Guertin’s showcase of new media writing by women (1999-2005) , for example, I found a dead link to Mythologies of Landforms and Little Girls, a hypertext work I made in 1996 which was exhibited in 1997 by StudioXX, a feminist artist-run-centre in Montreal. Though that particular webserver doesn’t exist anymore, StudioXX is still alive and well. I don’t mind at all that this link is broken. I’m thrilled to discover that it was there at all, to know that in the late 1990s someone way over in England was looking at this early work. The trAce Archive is full of these sorts of traces. Layer upon layer of dated design aesthetics overlap and peel like wallpaper, revealing earlier versions beneath. The occasional page errors, dead links and missing images are artifacts of the web as it was, a web in progress, a web in the making.